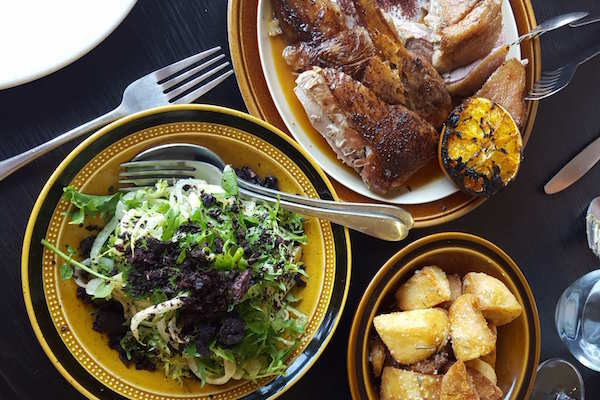 HOLY SMOKES people, get yourselves to this great new Pokolbin hot spot, Yellow Billy, a restaurant that really took us by surprise, it was a very pleasant surprise at that! The unique flavours are produced with the use of a purpose-built open fire/smoke house which produces tender, juicy meats with a fantastic smokiness that is absolutely delicious. We ordered the Suckling Pig with Apple Jam and Crackling, (of course! ), Roasted Duck with Sumac Yoghurt and Burnt Orange with sides of Crispy Potatoes with Garlic and Rosemary Salt, Honey Roasted Cauliflower with Tahini, Seed and Nuts and the Shaved Fennel Salad with Watercress and Dried Olives. The pork was melt in your mouth, the duck crispy skinned and tender. Our delight was obvious as the table fell silent as we couldn’t help but tuck in! The sides perfectly complemented the proteins, the cauliflower sweet and smoky with the tahini providing a peanut butter flavour and texture and the fennel salad was indeed the perfect way to balance the richness of the meal. We chose to share dessert of a Boozy Tiramisu, served from a large bowl with a very big spoon, Portuguese Tart and the Orange Blossom Syrup Cake with Saffron Mascarpone. Of course, they were all so good, the plates were scraped clean in no time! Overall, we’d have to say “YUM”. You won’t be disappointed, and we all can’t wait to return. The service is efficient, friendly and professional and for the moment you can BYO your favourite alcoholic drinks! If you are unprepared for that, just pop next door to Piggs Peake’s cellar door for a huge selection of wonderful wines.